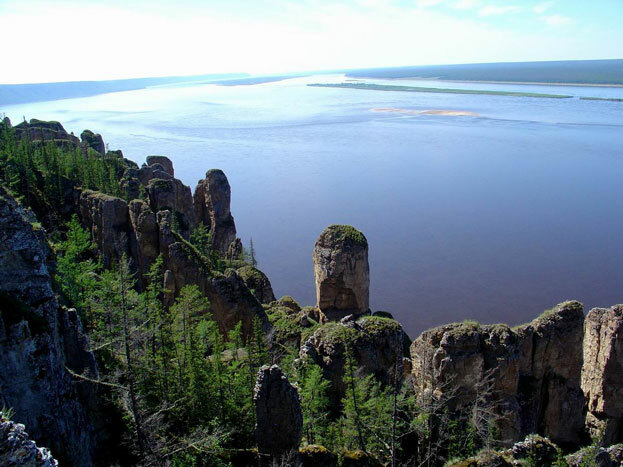 UNECSO has included the natural park "Lenskie Stolby" in Yakutia (a region in Siberia) in its World Cultural and Natural Heritage List. This decision was taken after 10 years of inspections. This is already the 25th site in Russia that has been included in this list. The name of the park, "Lenskie Stolby", means "pillars on the river of Lena". 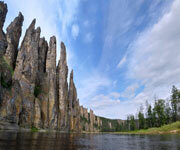 These are lime rock pillars of a peculiar form, up to 100 meters high, which line the bank of Lena. The site, which attracts many tourists, is situated in about 100 kms from the city of Pokrovsk. The "Lenskie Stolby" natural park occupies nearly 500,000 hectares. This park is situated in Khangalassky uluss, 100-200 kilometers south of Yakutsk. It covers an area of 485 thousand acres and has 868 thousand acres of buffer zone. Tourist lodges "Buotama" and "Verhniy Bestyah" are located on the territory of the park. It is a perfect place for those who love nature and unique experiences. Lenskie stolby is a masterpiece shaped by water, heat, and cold. It is a jewel of the Lena River. Ancient rock has been turned into what seems like columns, towers, arches, cathedrals, walls; and unexpectedly, in the middle of the taiga, one can see sand dunes called tulkans. The park is a habitat for many rare animals and plants. It is a place where the remains of mammoth, bison, and other fossil animals are still found. Ancient dwellers of this place left a vast variety of hyroglyphs. Samples of old Turk runic writing can also be seen. The landscape adds a unique touch to hiking, water touring, and other activities. An existing trip can last three to five days. It is a great place for fishing due to a variety of back-waters and former river-beds. The Basin of Buotoma River – its downstream part – is a habitat for the great Manchurian deer. The rout begins at a place called Kuonan. Tourists can get to Kuonan by the Yakutsk-Niever road. All information about rafting and safety precautions, as well as an overnight stay at a huntsman lodge, are offered to tourists at Kuonan. There are two stops along the route, first at Kueh-Khaya place where tourists can take a rest in a cabin, and second at the mouth of the Buotoma River. Here tourists can take a rest in cabins and in tents at a camp ground. The destination is the village of Kachikatzy. The park offers guide services, tents, rubber boots, and safety vests. This is a good place to enjoy nature, fishing, and swimming. Buotoma Motor-ship takes tourists to the camp, where camping, bedding, and kitchen utensils are available, but food is self-served. Tourists can get here by car. Summer cabins, bedding, kitchen (as well as kitchen utensils), self-serve food, music, dancing, water and fishing equipment, are all offered at the lodge. Extra services include bar, rowing, sauna, and transportation to Yakutsk.